The appearance of a second deep "foundation" posthole near the James Fort extension has raised questions about the look of the fort before or just after the "starving time" winter of 1609-10. 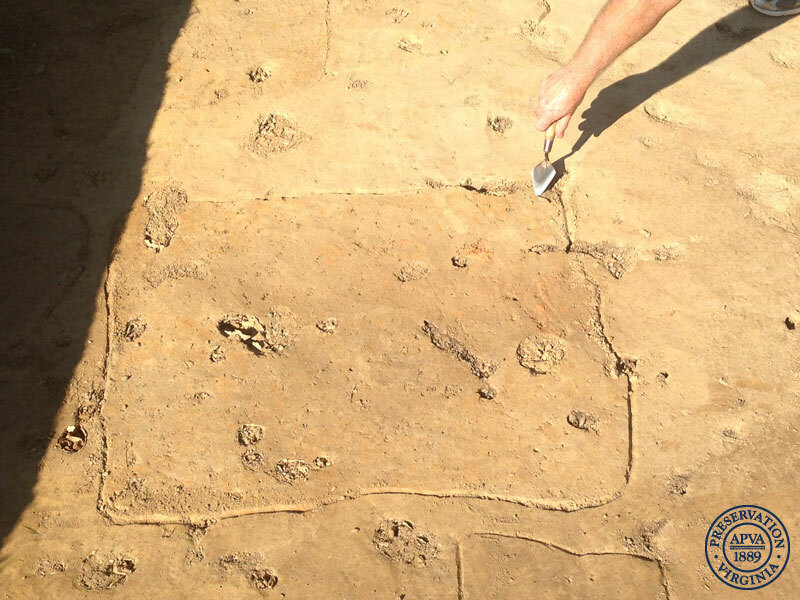 The two holes go four feet deep, said Dr. William M. Kelso, head of archaeological research at Historic Jamestowne. "To call them post holes is almost underreporting. They are huge structural features," he said. "The only other place we found such deep post holes was the 1608 church." The first hole was located in August near the visitor walkway that passes through the gate entrance to Preservation Virginia's land on Jamestown Island. The second was found in mid-September 24 feet to the south of the first hole. That kind of math makes the Jamestown Rediscovery team suspect a building, so in late September the archaeologists opened another section to the east to look for a similarly large post hole 12 feet away. Kelso said the two holes could be explained by three possibilities: the posts mark one large building that will extend to the east; the two postholes mark the corners of two different buildings; or the holes may be part of a wall that colony secretary William Strachey described as made of planks and posts -- a different style of construction and to the East of the triangular palisade of the 1607 James Fort also described by Strachey. The plank and post style is called a paling, and that kind of construction would lead to questions about how permanent the extension of the fort was meant to be, Kelso said. "Having posts in that kind of wall that are 24 feet apart is a long distance, but it could be. Making trees into clapboards, flat and rough, means you can get more of a wall out of fewer trees," Kelso said. If the holes are corners of a building instead of supports of a wall, then they point to a more substantial kind of construction -- a style of architecture that marks Captain John Smith's era of leadership. Smith complained about the first buildings in James Fort being flimsy, and the evidence of things built during his tenure as leader -- the first well, the 1608 church -- shows a dedication to more stability. And perhaps more security. The posts may mark a blockhouse. There are two references to the James Fort settlers hiding in a blockhouse near the end of the "starving time" winter in which two-thirds of the fort residents died. Lord De La Warr arrived on a resupply ship in June 1610 and described the fort being in disrepair. He sent a letter to company officials dated July 7, 1610, describing the difficulty of the starving time: "Only the blockhouse, somewhat regarded, was the safety of the remainder that lived, ..."
Strachey, who arrived at the fort the month before De La Warr, also mentioned the blockhouse in his account of the terrible winter before: "And it is true the Indian killed as fast without, if our men stirred but beyond the bounds of their blockhouse, ..."
A blockhouse would likely be marked by many early fort-period artifacts. In the last full week of September the archaeologists found a clay pipe that could be from the first years of the settlement because it has a small bowl (when smoking tobacco was expensive and monopolized by Spain, the amount of tobacco smoked in each pipe was smaller). But there is much more work to be done, Kelso said. "We are speculating at this stage and we won't know any time soon because we have a lot of dirt to move," he said. The work in these open sections has produced a lot of American Indian artifacts. Archaeologists removed the giant stump of a tulip poplar tree felled in Hurricane Floyd in 1999 and found in the vicinity of the stump three quartz crystal points similar to (but smaller than) the one on display in the Archaearium. 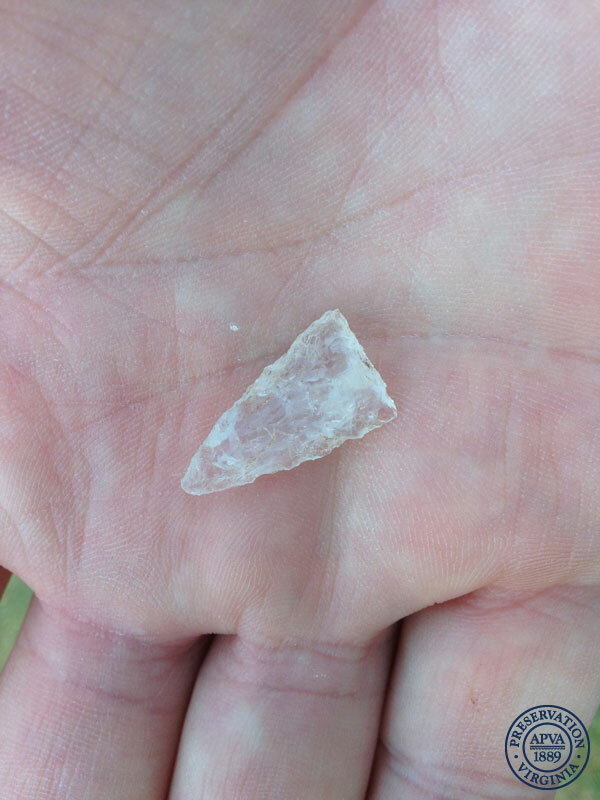 Kelso found the displayed crystal point about 100 feet away from where the three were uncovered this month. "When you look at these points, you come to understand how skillful the natives were in shaping the stone points which actually are real works of art." Kelso said. 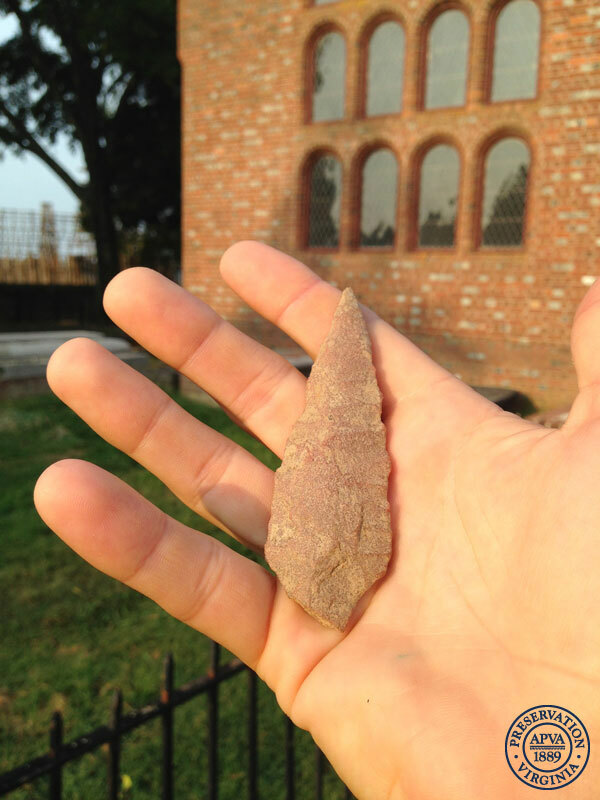 Much larger was an archaic projectile point roughly 5000 years old that the archaeologists found in the same area. The Jamestown Rediscovery archaeologists have found points that large from that period before, Kelso said since the island was occupied for millennia before the English arrived.